The Prince Edward County Job Board is an active feed of all local job board listings into one central location! These job boards include Career Edge, Indeed, Kijiji Jobs, the Government of Canada Job Bank . Feel Free to click on any of the job opportunities which will take you to the respective job posting sites. 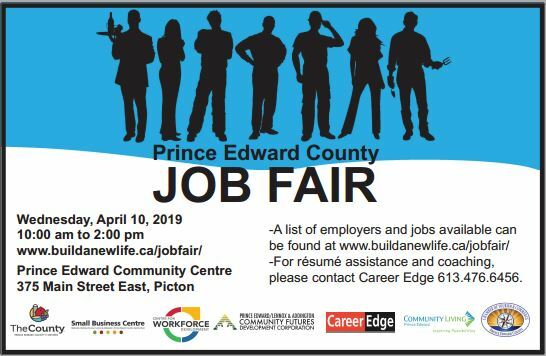 Don’t forget about the upcoming PEC Job Fair! More Jobs are listed on there that may not be below! The County does not administer or manage any job board. We do not accept job postings. Employers are encouraged to submit job postings with either Career Edge in Picton, or use one of the many online job boards, including Indeed, Kijiji, or Zip Recruiter which distributes your posting to multiple job boards for you. Once posted, the listings will show up on this page within a few hours. As an employer, when filling out a job posting, please ensure the town of Picton, Bloomfield, or Wellington is included for search-ability. It is also a good idea to include the keyword “Prince Edward County” in the title or description.